My Austrian cousin and his family lounging at Saratoga beach near Courtenay last week. My cousin cracks himself up constantly, with his wife and daughters (and the rest of us) often wondering what exactly he is laughing about. I think he was giddy with jetlag and the excitement of a big vacation. But at least he has figured out what any comedian knows: always commit fully to the delivery of your material, no matter what. 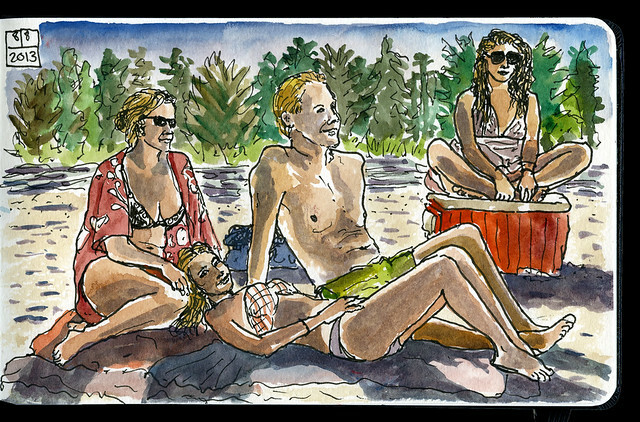 His family draped themselves like this on the beach, I just had to draw them. Four free models! I swear I did not set up the pose. They have moved on to visit our other family members in BC and Alberta. It was great fun, B. and family! Come back anytime. Meanwhile, six of us (two friends, our teenage visitor, my sister, Jeff, and I) headed as far west as is possible in Canada to go backpacking for 3 days.